This is a composite (character placed in different background). The subject was actually a steampunk character taken at the Weekend at the Asylum in Lincoln 2014. It was taken in the castle grounds but the background was somewhat cluttered. 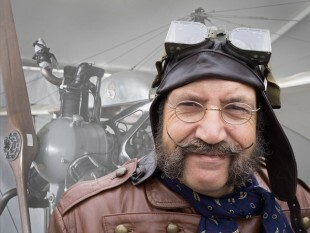 As he looked like an old time aviator, I dropped in a shot of a Bleriot aircraft taken at a recreation of the English Channel crossing a couple of years earlier. I toned down the background a little to maximise attention on the foreground character. While walking in Rue Touahen close to the sea wall in the old town of Essaouira, I came across this beggar who wanted some money. 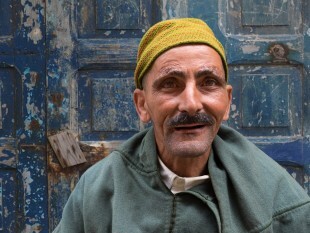 It is normally difficult to photograph people in Morocco but as he wanted something from me I thought I would have something in exchange. I indicated to my camera and he nodded. I took a shot and gave him some money. He can be satisfied that he didn’t beg from me but that he had earned some money. This was an Olympus ‘Big Shoot’ event with Damian McGillicuddy. Damian wanted to create a somewhat chaotic scene with a bride and light it with both warm and cold lights. He use two Yongnuo battery flash guns with gels over them and triggered by a wireless transmitter on the camera. Damian is a very creative photographer and pulls together both model and locations to create some different images. It was a damp day in London and I was looking for things to photograph outside of the Bank when a bus pulled up. 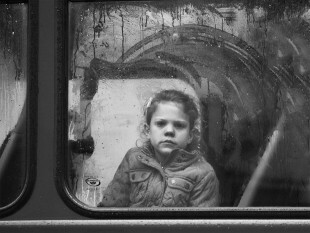 The windows were wet on the outside and had condensation on the inside but I could see a young girl staring out. She caught my eye and she saw me point the camera. This was that moment. It was a wet day and a few people were sheltering in the entrance of St Paul’s Cathedral in London. I noticed this lady with the bright pink hat sitting just behind the pillars and thought that the contrast of the bright hat with the somewhat drab stonework might make an interesting contrast. She didn’t notice me – she was too engrossed in her mobile ‘phone to observe the people around her. This was an Olympus-sponsored street walk with Rob Pugh. 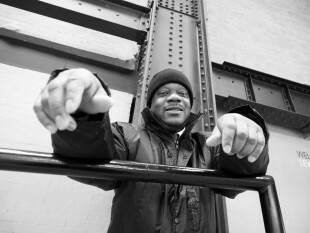 We were taking photographs in the Tate Modern and I saw this security guard. Being bold as I am with strangers in my street photography, I walked up the guy and started chatting to him. I explained my purpose and asked if I might take a photo. I chose a wide-angle lens and shot from below. I deliberately wanted the hands framing the face but I didn’t want them sharp to take attention away from his face. This was taken on an Olympus workshop called “Fashion Portraits in the Studio” and run by Rob Pugh and Gavin Hoey in February 2016. This shot was taken in the morning session and showed what may be achieved with simple lighting. This was a single flash head fired through some sackcloth that was held up by two volunteers. The model was Amber Tutton. 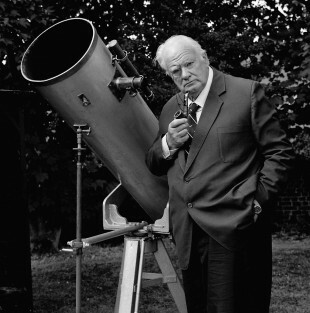 Patrick Moore had many telescopes in his garden, some with special housings to protect them from the elements. I wanted a shot with him standing next to one of his reflector telescopes. In typical Patrick style, he wanted his pipe and wore his monocle. I chatted to him for a couple of hours and though he was very courteous and answered all my questions, I sensed that only a fraction of his mind was engaging with me – the rest was pondering some astronomical problem. A great man now sadly missed.